What a perfect prompt for this autumnal day! I had a big ol’ kabocha squash sitting on my counter, and all day long I mused about how to use it. Simple roasted slices? This beautiful soy-braised preparation? A gingery soup? And then, on the give-and-take bookshelf at work, I found a copy of Mark Sutton’s Heart Healthy Pizza cookbook up for grabs, and pizza sounded mighty appealing. 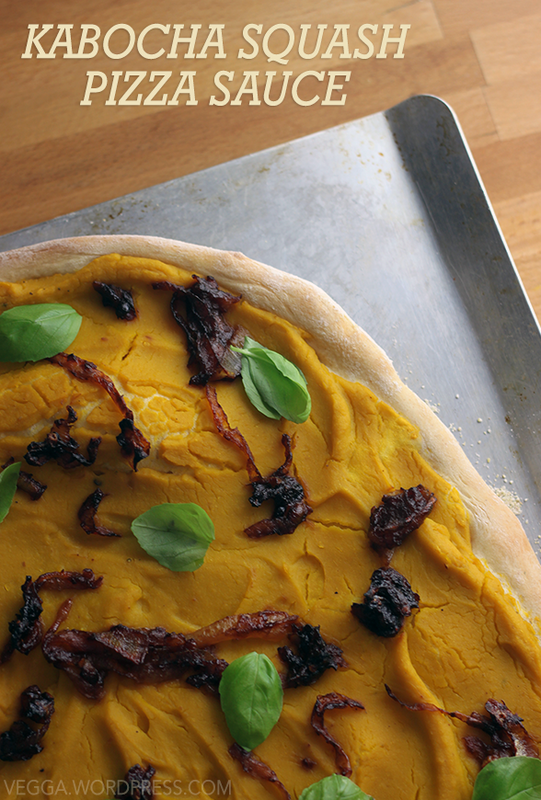 I’ve seen butternut squash-based cheezy pizza toppings, so why not kabocha?! I decided to make a thick sauce to top a pizza, and it exceeded all my expectations. This sauce is creamy, complex, and perfectly flavored with roasted garlic. And it’s a unique, unexpected way to use kabocha squash! You can prepare the sauce ahead of time, but I did everything in one night. It’s a little time-consuming, but there’s downtime for each component that lets you prep the next component. I included my workflow in the steps below. Preheat your oven to 400˚ and pour a little water into a rimmed baking tin. Leaving the rind on, roughly slice the kabocha squash into sixths; don’t worry about how even they are. Place the slices rind-down into the baking dish, drizzle with a little olive oil, and place in the oven. Next, prepare the garlic for roasting. Add the foil packet to the oven and bake both the squash and the garlic for about 45 minutes, or until the squash is fork-tender. In the meantime, prepare the pizza dough, following your recipe’s instructions. Let it rise while the squash and garlic are in the oven. If you’re topping your pizza with caramelized onions, start caramelizing them now. To make the sauce, carefully scoop the squash out of the rinds and add it to a food processor. Squeeze the garlic out of the papery skins into the processor. Be careful here too; it’ll be hot. Add the rest of the sauce ingredients and process until it’s very smooth and creamy. Spread the sauce as thick as you’d like on the dough. (Save any extra to use with pasta!) Top with caramelized onions and bake for 12 minutes. Remove from the oven, sprinkle with basil, and let cool for about 3 minutes before slicing. Enjoy! I was already won over at ‘kabocha’! oh man, that looks so beautiful. I’ve been all in summer mode, and I kinda forgot about kabocha! But I love it so much. I think it’s my favorite winter squash. I love love love that velvety texture and the deep color. Late summer has been unseasonably warm here, so I feel you! But the squashes are out in full force so I just had to pick this one up.